FOX Sports Wisconsin announced Friday that it will televise Games 1, 2, 3 and 4 of the first round of the 2019 NBA playoffs between the Milwaukee Bucks and Detroit Pistons. All telecasts will include “Bucks Live” pregame show, as well as postgame coverage. Television and live streaming coverage on FOX Sports GO begins April 14 at 5 p.m.
Jim Paschke will call play-by-play for the games alongside analyst Marques Johnson, with Katie George reporting. Craig Coshun will host “Bucks Live” alongside Steve Novak. 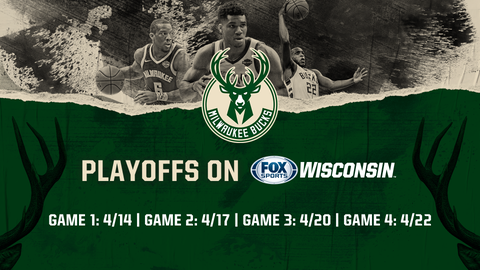 “Bucks Live” pre and postgame shows, as well as the first-round playoff series, will be streamed live on FOX Sports GO. FOX Sports GO is available on FOXSportsGO.com or on the FOX Sports GO app, which can be downloaded from iTunes,Google Play, Amazon App Storeand Windows Store. Streaming is also now available on several connected devices, including Apple TV, Android TV, FireTV, Roku, Chromecast and Xbox One. The broadcast schedule for games 5, 6 and 7 are still TBA. Additionally, the regional sports network announced that the 2018-19 regular season was the highest rated Bucks season in 17 years. The Bucks finished the regular season with a 3.1 HH rating in Milwaukee, a 33% increase over last season.